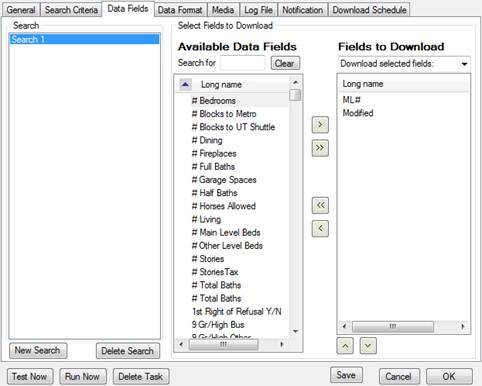 The Download Field Selection form enables you to specify which data fields are included in a download. You can access the Download Field Selection form in step 4 of the Create New Task process, or by clicking a task’s Data Fields tab when modifying the task (see Modifying an Existing Task). All fields that appear in the Fields to Download list will be included in the download. 1. If you are modifying an existing task, click a search in the Search list to select it. 2. Select Download selected fields from the Fields to Download dropdown menu. 3. Click a field name in the Available Data Fields list to select it. • You can narrow the field list by typing part of the field name in the Search for text box. Clicking the Clear button restores the full list. • To select multiple field names, hold down Ctrl while clicking the field names. 4. Click the Move Right button (>) to move the selected field name(s) to the Fields to Download list. • Move field names between lists by selecting them and using the Move Right (>) and Move Left (<) buttons. • Use the Move All buttons (>> <<) to move all field names from one list to another. 5. Select field names in the Fields to Download list and use the Move Up (^) and Move Down (˅) buttons to set the order in which you want the data to appear in the download. Some RETS servers may not honor the requested field order. • If you are creating a new task, click Next. • If you are modifying a task, click OK, or continue to another tab.